An art exhibit that originated at University of Lynchburg’s Daura Gallery will open Saturday, May 12, in Richmond at the Virginia Museum of History & Culture, formerly the Virginia Historical Society. 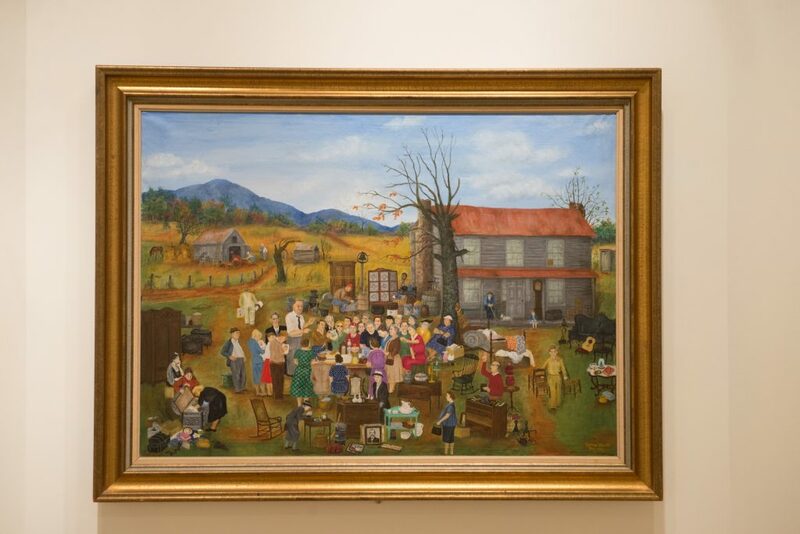 Inside Looking Out: The Art of Queena Stovall includes 44 of the 49 known paintings by Amherst County, Virginia, folk artist Emma Serena Dillard Stovall, who went by the nickname “Queena.” In addition to the colorful paintings, which show scenes from rural life, the exhibit includes personal items that were owned by Stovall and depicted in some of her paintings. In March, curator Ellen Agnew and Dr. Rothermel also released a book in conjunction with the exhibit. It is available for purchase at Dillard Fine Arts Center. “End of the Line,” by Queena Stovall, is one of 44 paintings in the exhibit.